Another Possum In Brampton, Ontario!! We have had visitors in our backyard since the green bin program has been implemented. Frustrated with the mess, I now securely fasten the compost lid with bungee cords, however, the animals still smell the food and come to investigate. We were curious to see the culprits, so my husband bought a night motion-sensor camera. Our family knew about the Skunks and Raccoons, but this little visitor took us by surprise. A Possum has been in our backyard on a regular basis! The kids were thrilled to see the pictures which turned out beautifully - here's one example. Comments for Another Possum In Brampton, Ontario!! Saw an Opossum yesterday in my backyard at Mayberry Crt. It was quite large and it walked into the bush when it saw me. This is my third sighting of a creature in my backyard. Thanks for the clarification, but there is no confusion between the North American and Australian marsupials. I use the terms Opossum and Possum interchangeably because, although officially they are Opossums, most people call them just Possums. It is a little like the pretty, small European Robin (Erithacus rubecula) which is vastly different from the North American Robin (Turdus migratorius) which is a member of the Thrush family. Or the Badger; the North American Badger is completely different from the European Badger, but there is no confusion because they exist on different continents. We just call 'em Badgers. If we were being completely accurate, we'd refer to North American Possums as Didelphis virginiana of the order Didelphimorphia, but for my readers and those who already know the difference between the North American and Australian marsupials, I will continue to just call 'em 'Possums! I just saw an old looking Possum in yard at Vodden Court, at 8 p.m. Cat was sitting 6 feet away, possum walked around, the cat just watched, did same thing with Raccoon. Possum wandered under deck. Just saw one this morning sauntering around my pool and backyard - good size one - Bramalea/Balmoral area - D-section of Bramalea. 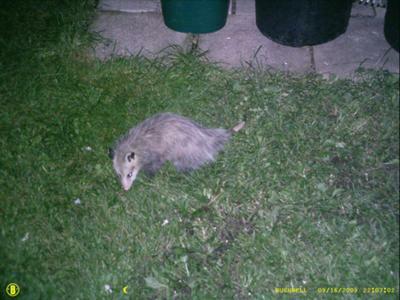 We saw a Possum in the back Garden last night in London, Ontario, Old South. October 21, 2012 Just saw a rather large Possum near the back door. He looked rather imposing so I had no intention on approaching him/her. It was quite large, perhaps 10 lbs or more, white with grey markings on the back. The neighbors have dogs that are smaller. This is the second time I have seen him this week. This is in the Brampton core area of Beech and McCaul Streets. One of the neighbors on Woodward thinks he's a farmer and the backyard is host to a number of creatures. Perhaps this is why it's hanging around or it may be visiting from the cemetery on Church Street. Regardless it is best not to approach them. Next time I will try and get a picture. I investigated a hole under my deck and found I have a Possum, neighbors are terrified they think it is a raccoon but after reading about them I have assured them it is harmless. I will leave it alone until it decides to leave. Yeah - we just got home from work and went to bring in the green bin. One of the little rascals is sitting at the bottom of it enjoying whatever the garbage guys left behind this morning. I didn't realize we get them up here glad to see it's not just us.